Police officers are "scared and demoralized" and have reduced "proactive policing" due to intense criticism from the public and national politicians amid heightened anti-cop activism, according to a recent FBI study. The report, titled "Assailant Study–Mindsets and Behaviors," was first reported Thursday by the Washington Times. It was written in April, according to FBI spokesman Matthew Bertron, and examined 50 of the 53 incidents last year in which police officers were killed on duty. The report comes at a time when the killing of police officers is conspicuous in the news. Last summer, five officers were killed in Dallas and three in Baton Rouge in the wake of the shooting death of Alton Sterling by Baton Rouge police. These were two of the most high-profile incidents; 135 law enforcement officers were killed in 2016, a 10 percent increase from the prior year and the highest total since 2011, according to the National Law Enforcement Officers Memorial Fund. The main cause of officers' deaths was firearms-related incidents, with 64 being shot and killed, representing a a 56 percent spike from 2015. Among those shootings, 21 deaths were due to ambush-style attacks, including the deaths in Dallas and Baton Rouge. The NLEOMF said this was the highest total in more than two decades. The FBI report, which focused on "mindsets and behaviors," broke down the thinking that inspired attacks on police, as well as the underlying factors that it believes drove them. In surveying assailants, there were two expressed reasons for their actions: "a desire to kill law enforcement," and the fear that the assailant was "going to lose their freedom by going back to jail or prison." The former category, containing 28 percent of assailants, included those with social or political reasons for attacking officers, as well as a general hatred of police. 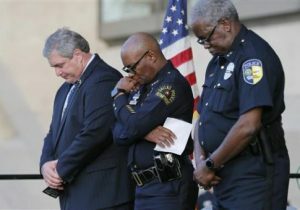 This group included the ambushers in the Dallas and Baton Rouge killings, who, according to the report, "said they were influenced by the Black Lives Matter movement, and their belief that law enforcement was targeting black males." Assailants motivated by social or political reasons or hatred of the police often expressed their views on social media or told friends and family before their attack. In general, the desire to "get justice" for those they believed were unjustly killed by police was a major driving force in the decision to attack. The study further highlighted the negative impact of highly scrutinized police incidents over the past few years. "Specifically, the Michael Brown shooting in Ferguson, Mo., in 2014, and the social disturbances that followed, initiated a movement that some perceived made it socially acceptable to challenge and discredit the actions of law enforcement," the report stated. "This attitude was fueled by the narrative of police misconduct and excessive force perpetuated through politicians and the media," it continued. "Assailants were constantly exposed to a singular narrative by news organizations and social media of police misconduct and wrong-doing," which elected officials did little to disrupt. This narrative led, for example, to an officer afraid to shoot an assailant who had slammed him to the ground and was beating him. According to the report, the officer did not not shoot the assailant because of not wanting his or her "family or the department to have to go through the scrutiny the next day on the national news." The problem is compounded by what the report called a "turnstile justice system," with criminal justice reform bills, including decriminalization and reducing penalties for drug use, driving an increased rate of release for criminals. This factor, the report argued, leads to criminals doubting the severity of punishments for wrongdoing, especially while under the influence of drugs. This intersection of narrative and decreased effectiveness of the justice system causes what the report called "de-policing": police making "the conscious decision to stop engaging in proactive policing." Police are increasingly "scared and demoralized," and avoid engagement with communities where they are not trusted and defiance and hostility are the norm. De-policing, the report warned, led to a state of affairs where police were "purely reactive," unwilling to engage with distrustful communities and cowed by a critical news media. Across the 50 assailants examined, several common features were apparent. Eighty-six percent had prior criminal histories, and 56 percent were "known to the local police or sheriff's department." Twenty-four percent had known gang affiliations, 44 percent had a history of domestic violence, 26 percent had active warrants, and 32 percent were on probation or parole. Demographically, all of the assailants were male. Nearly half, 48 percent, were white, 36 percent were black, 14 percent Hispanic, and 2 percent were Alaskan native. Moreover, 18 percent had "diagnosed mental health issues," but "mental health concerns were anecdotally identified" in 40 percent of cases. Sixty percent had a history of drug use, with at 32 percent under the influence at the time of the incident.